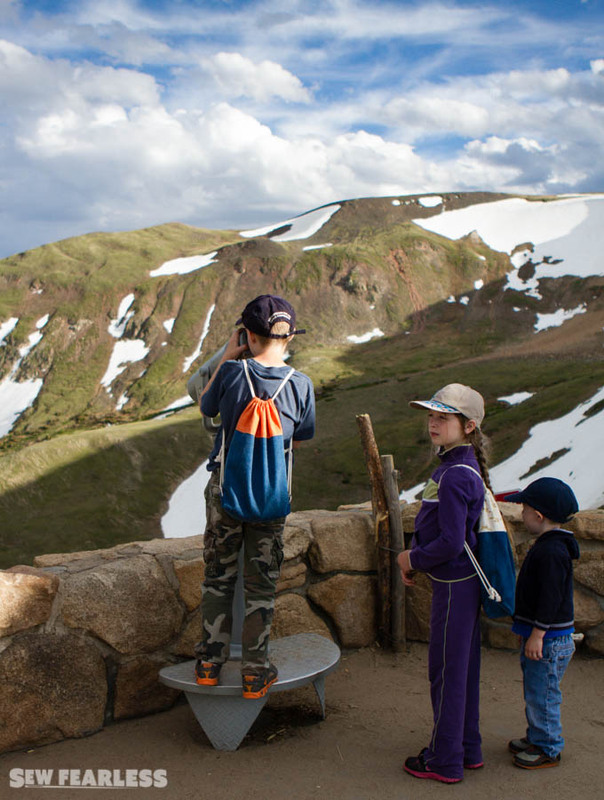 Last June, we went on a crazy 3600+ mile road with our 6 kids in a tiny minivan. It was insane – a good insane, but insane none the less. 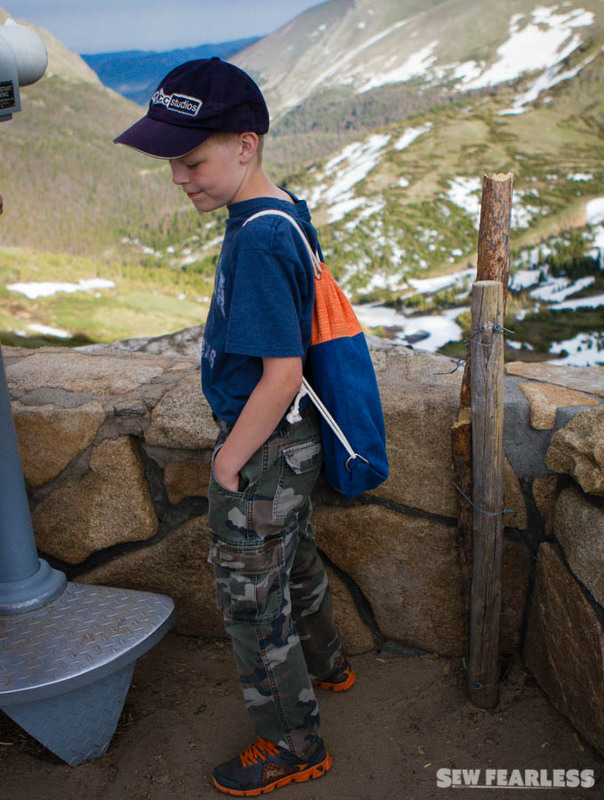 When I was trying to figure out how to manage it, I decided each child needed a place for their hats, toys, sweatshirts, and other necessities. The solution, or course, was to sew something. 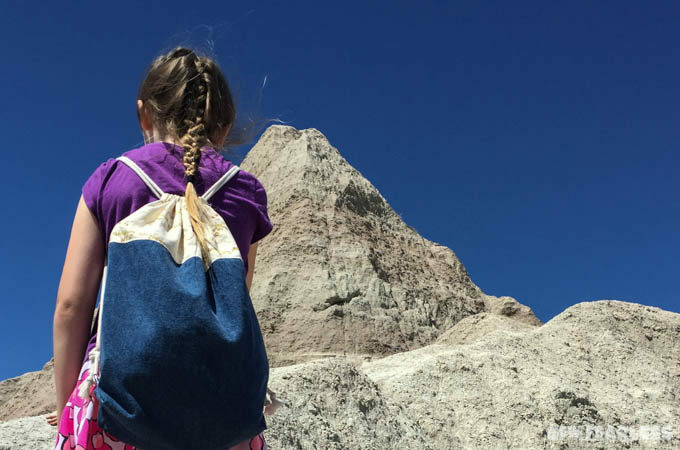 I made five drawstring backpacks. There are a plethora of drawstring bag and backpack tutorials out there, but I am throwing one more in the mix because 1) it is lined which makes them more sturdy and beautiful and 2) I think the way the D-rings are attached is really neat. Basically I “boxed” the corners outward instead of inward, and used the excess fabric to attach the D-rings. Neat, huh? 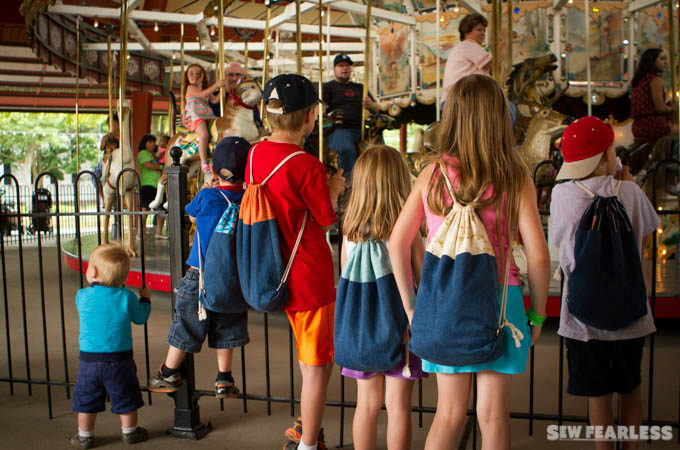 The kids love their bags. 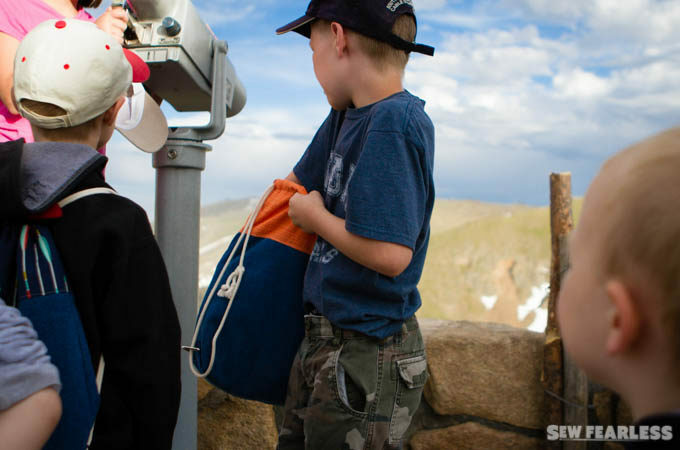 They worked really well for the trip and they still use them for their play at home. 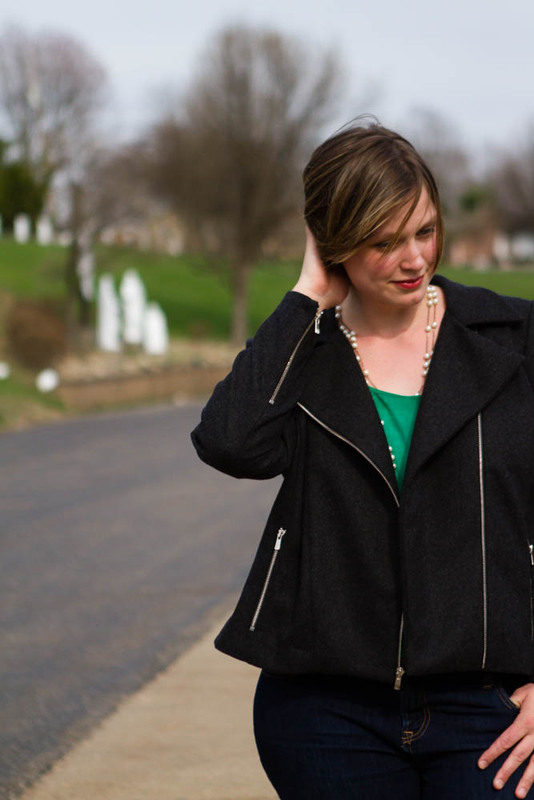 Read on to learn how I made these. 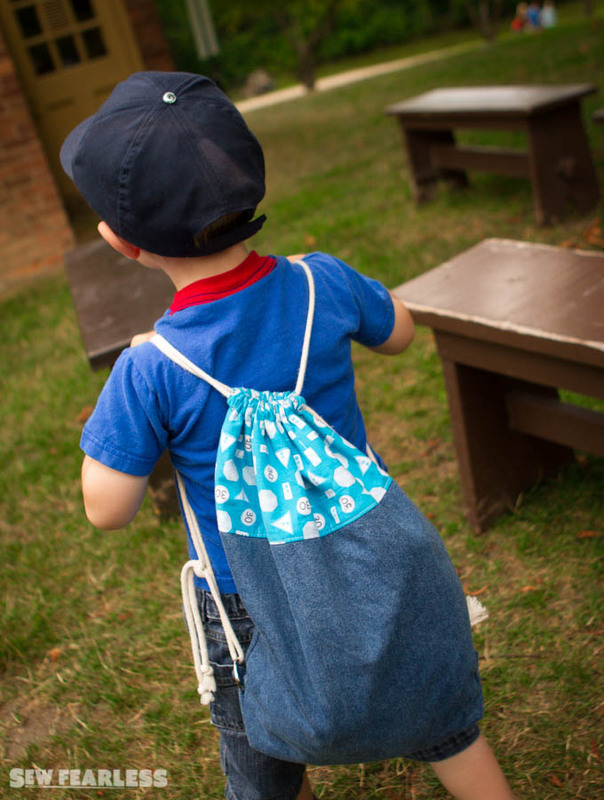 Normally, I like to use photos for my tutorials, but I was in a rush when I made the bags. My super-amateur diagrams will have to do. Step 1: Cut out pieces. 2 pieces of contrast quilting cotton 14 inches wide by 24 inches long. NOTE: For extra durability, back the quilting cotton with a woven fusible interfacing. Step 2: Sew the pieces together along short edges. Sew the pieces together, right sides facing, along, short edges. Press center seam open. 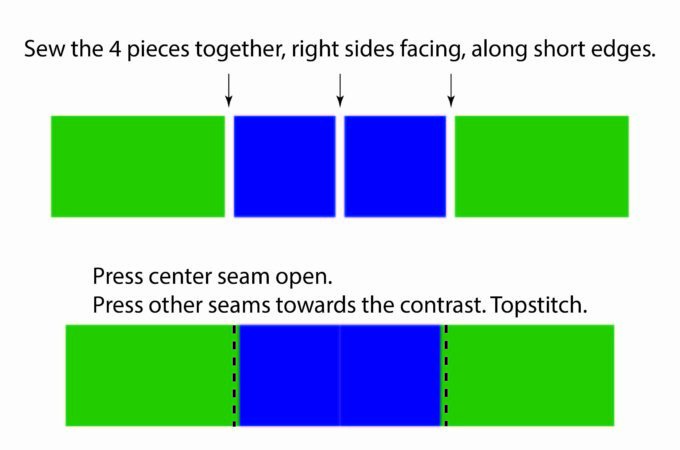 Press the other seams toward the contrast pieces, and then topstitch. 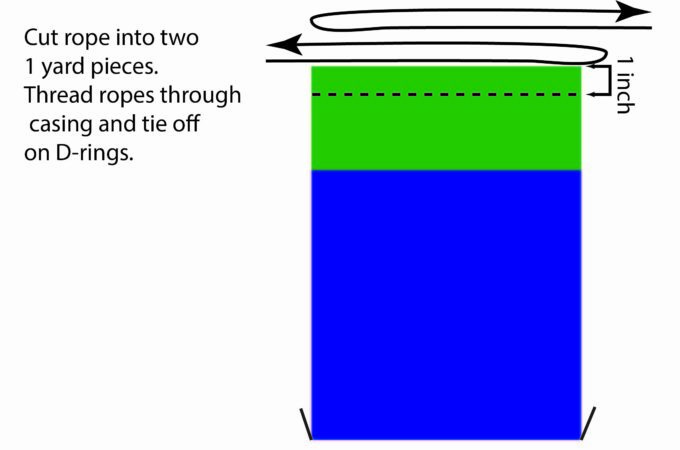 Step 3: Fold the fabric strip in half. 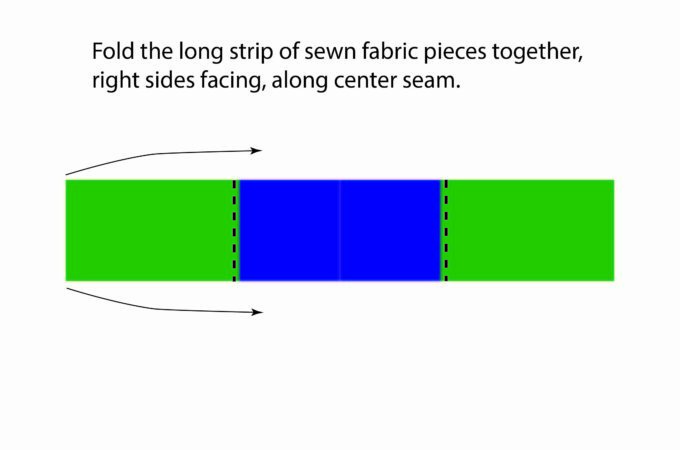 Fold the fabric strip in half, right sides facing, along center seam. Step 4: Sew the halves together along the open edges. 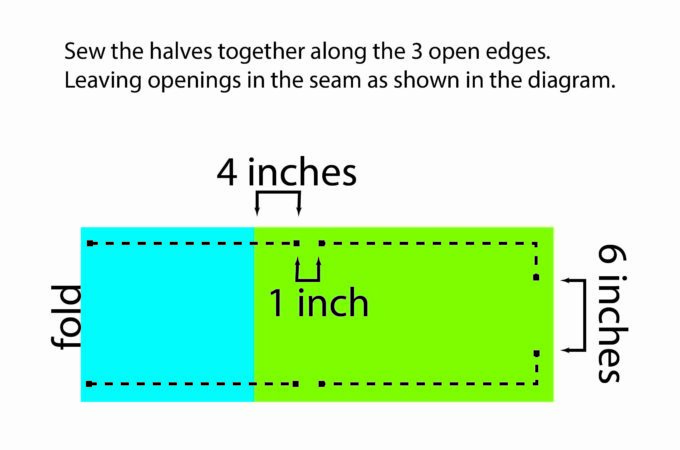 Sew the halves together along the 3 open edges, but leave openings in the seam as shown in the diagram. The 1 inch openings will be used for casings, and the 6 inch opening will be used for turning right side out. Step 5: Sew D-ring flap. Turn the bag right side out through the opening in the contrast. 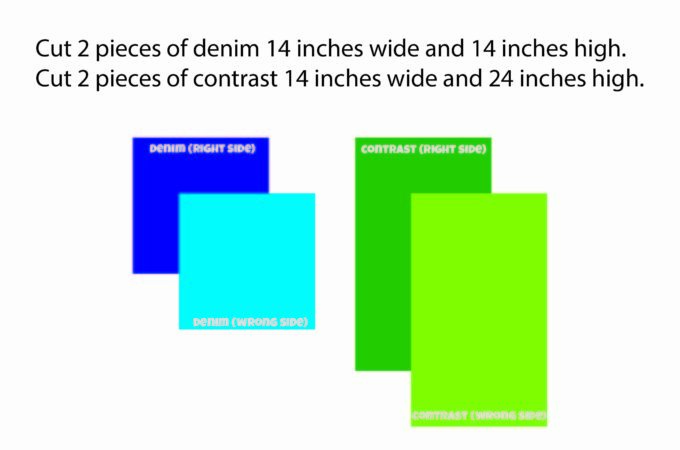 “Box out” both of the bottom corners of the denim. 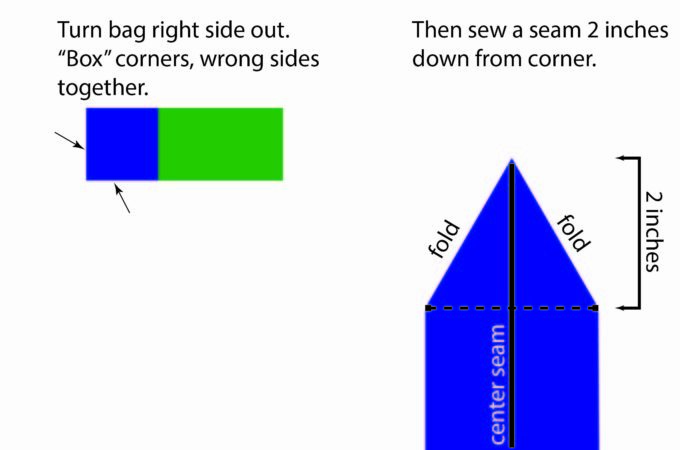 To box a corner, bring the bottom seam towards the side seam wrong sides together, matching seams. Sew a seam 2 inches down from the corner, perpendicular to the center seam. This creates a triangle flap of fabric on the outside of the bag. Step 6: Sew D-rings on to corner flaps. 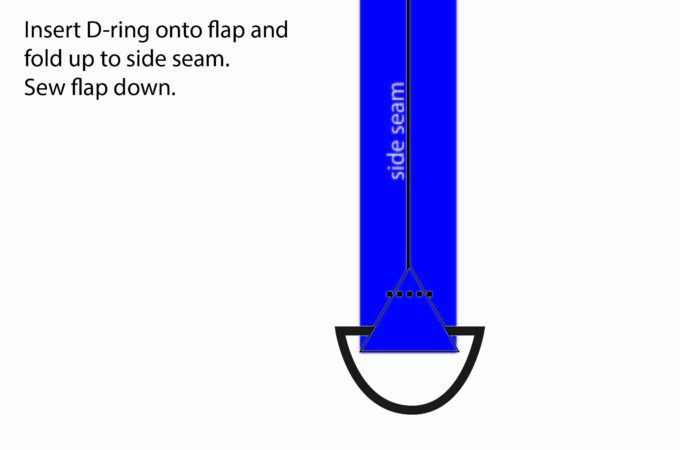 Insert a flap into a D-ring, and fold up to the side seam. Sew the flap down to the side of the bag. Repeat with second flap and D-ring. Step 7: Sewing drawstring casing. 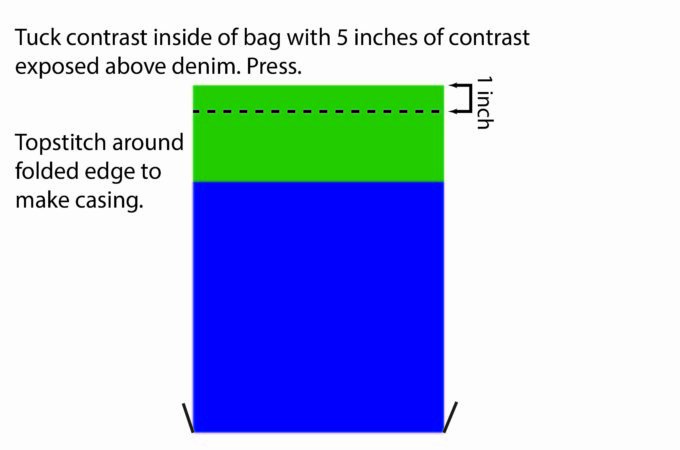 Tuck the contrast inside of the bag with 5 inches of contrast exposed about denim. Press. Topstitch around 1 inch down from the folded edge to make a casing for the drawstring ties. Step 8: Insert ties/bag straps into casing. Cut two 1 yard pieces of rope. Insert one rope through an opening in the casing, pushing through all the way around the casing and out the same opening it was inserted in.. Insert the second piece of rope into the opposed opening in the casing, pushing through all the way around the casing and out the same opening it was inserted in. Tie off the robes onto the D-rings to make backpack straps. 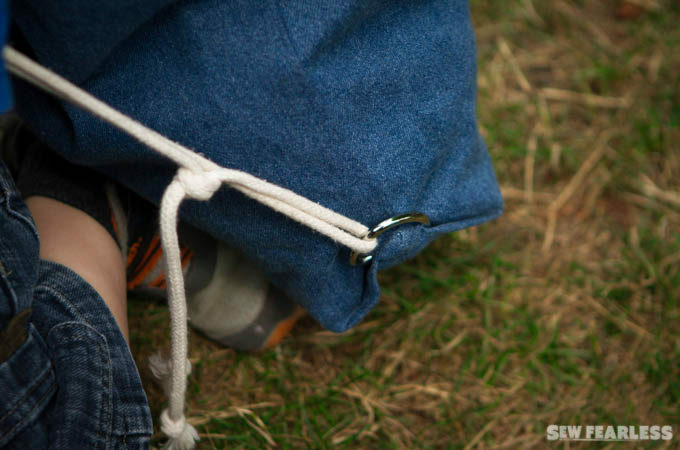 What are the final dimensions of your drawstring bags? These look really neat and useful!